Much like elves in LOTR campaigns, it's hard not to make ninjas massively overpowered just for fun. I rely on players to pick fun specialties outside of the class to fit the flavor of the ninja, rather than giving bonuses to things like disguise. 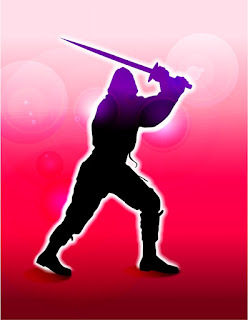 Ninjas rely on their knowledge of styles, and furthermore techniques within those styles, for their class mechanics. Ninjas are proficient in Martial Arts. This is an unusual weapon group - at first glance a player might wonder why Unarmed and Martial Arts are different weapon groups. The approach is different - Martial Arts damage is based off of Body, while Unarmed is based off of Strength. Martial Arts are much more dependent on the combination of Strength and Dexterity, compared to say a Conquestor brawling in a bar. Additionally, Martial Arts can make use of traditional weapons like sai, nunchuks, or a bo staff. Unarmed is purely weapon-free. In addition to Martial Arts, all Ninja are proficient in Thrown weapons. It's too hard to separate a Ninja concept from throwing stars, darts, etc. This had to be included. Some styles might allow a Ninja further weapon proficiencies. A Ninja's default initiative method is Fast. This means that during the initiative phase of each round, a Ninja draws 2 cards and picks their favorite. Other characters only get 1 card per round, unless they are under a magic effect of some kind. This supports the Ninja flavor in combat. Furthermore, when a Ninja is slowed, they only get reduced to Normal initiative. It takes two Slow effects stacking to bring a Ninja to Slow initiative. Ninjas learn martial arts styles that form the foundation of their play approach. Different styles offer different benefits. A style cannot be used at the same time as another style. A Ninja’s current style is selected during Maintenance. Outside of combat, it can be decided whenever appropriate. All Ninjas know Ninjutsu (unless of course they reach some sort of agreement with the GM). The essential flavor of a Ninja - slinking around hidden from view and assassinating folks - is contained in the Ninjutsu style. When in Ninjutsu style, a Ninja gains bonus damage when attacking from surprise. Ninjas start play knowing another style, of their choice. They have the opportunity to learn further styles as they advance in level. Here are some example styles: Aikido (grants a bonus to Martial Defense), Kenjutsu (grants proficiency in 1-H Striking weapons, like swords), and of course Kung Fu (grants bonus damage). The design idea behind styles is to have players make an intelligent - or at least deliberate - choice each round as to where they want a bonus. If six strong enemies are surrounding a Ninja, Aikido is probably a great choice, for instance. But they could go Kung Fu instead and try some fancy offense. It's the player's choice, but they can't have all the benefits at the same time - I like meaningful choices. I can also imagine that Ninjas fighting each other would need to choose their Styles in a manner that outwits their opponent, which is also fun. Ninjas with a high Discipline score can learn extra Techniques, but all Ninjas learn at least some. These are special abilities or attacks within each style. For example, a Technique inside of Aikido is the Defensive Throw. This is a reactive attack that lets a Ninja try to throw a melee attacker prone. In Kenjutsu, a Ninja can learn Iaijutsu, which lets them draw or stow a weapon at any time (even during an opponent's turn), so long as they are in the Kenjutsu style. It also lets them instantly counterattack anyone attacking from surprise (opposing Ninjas in the Ninjutsu style, for instance). Yes, I'm aware that in the real world, Iaijutsu is an art into itself - I am not being completely authentic but rather fantasizing these arrrangements to make the game fun and more cinematic in nature. Other Techniques include No-nu-se (a Ninjutsu phasing attack), Two-Finger Strike (a Kung Fu blinding attack), and other fun things that let a character ricochet thrown weapons off of multiple targets, or fight in the dark, or pretty much anything else I could scribble down after watching bad kung fu movies or Big Trouble in Little China. The big idea here is that a character can choose to specialize - learning a bunch of Kung Fu techniques - or generalize, picking one or two technique from each style they know. I know I'm tarring myself with the pedant brush here, and I'm sorry about that, but if I mention it now and you make a change it will hopefully stop others doing it. Either that or you just accept that you're running a fantasy game and people like me can take a running a jump. So, here we go. Kung-fu is Chinese, everything else is Japanese. I would think Jujitsu would cover the bases nicely, but as I say, it's a fantasy game. Please feel free to ignore all of the above. I can appreciate your pedanticism. I do know that Kung Fu is a somewhat vague term covering Chinese martial arts, and that mythic shinobi were Japanese special forces. However, as you mentioned, it's a fantasy game. Most players (at least the ones I play with) watch the crazy martial arts in movies and then get a kick out of using a Tiger Claw or Snake Block one round and then a katana the next round (and not in a lian bing qi sort of way). That's the fantasy, despite it not lining up with the genuine history of martial arts. The first thing that comes to my mind when I think of Ninjas is Ask a Ninja. I have improved upon your clip with a new post today. I think all the style names should be based on bad puns. I think mine need more work but you get the idea. Hmm I might have to steal a couple of these, although I will use them for technique names! Do I get a mention in the book? "Bone_Inspector: a very punny guy"